Alright, so here’s the deal: I get why this is a bestseller, I do. There’s snarky, sassy humor – exactly the kind that one would expect from a Weisberger novel. The standard wear of Lululemon and Athleta, etc., is made fun of continuously. 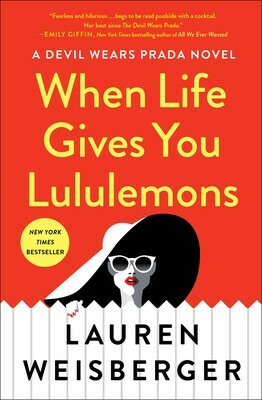 Its basically a full on satire of the typical suburban millionaire wife/lifestyle. And of course, its all fun and games to escape into that lifestyle and live that life for a day or two. Also, since summer is ending, its the perfect light summer read. I mean, there’s school and kids and babies throughout the novel, but you can just sip your mimosa along with the ladies in the book and be a little free, imagine life with an au pair. otherwise, it can project a really unhealthy image of self. Emily can only stop judging fatness when she herself becomes pregnant and fat. A whole chapter is titled “Munching Xanax like Gumballs”. Funny? Yes. Healthy or appropriate? Not so much – this book should not be read by someone who is young and impressionable. My other problem with this novel is just how unimaginative it is. (Spoilers below, although they might not even count as spoilers because the minute you understand how the plot starts out, you know the ending). I mean, yes, the minute details are super funny and well placed… current celebrities, Snapchat, etc. But in five or ten years? It’ll just be another snarky novel about bored housewives who’s husbands cheat on them or set them up or find a “housewife upgrade”. One of them doesn’t want to have kids until she realizes she does. The other thinks her husband is cheating until he gives her a big gesture. And the third is a supermodel who realizes her husband has used her all along. Let’s be honest, doesn’t this sound familiar? So yes, its a fun read. Its a snarky read, and it definitely helps you poke fun at yourself. Read it when you need to take a break, and don’t want to take life seriously. But don’t take any life lessons from it, because at the end of the novel you’ll realize that much of the jokes about Lululemon and Snapchat and rosé will be irrelevant in just a couple more years. I’m thinking this kind of book would generate irritation for me. I don’t like reading about lonely housewives. However, I can totally see why people do. Yes I agree on that! I think you’ll find lots of good quotes for your blog! I bought this one the other day while in Target. That place makes you buy all sorts of things haha. Read it! Sometimes the things other bloggers hate, I end up loving! I didn’t know that this novel existed! It looks like it could be a fun read! Read it if you were already planning too! A lot of people did really like the book, it just wasn’t my favorite.